MOSSES FROM AN OLD MANSE ..
HAWTHORNE, Nathaniel. MOSSES FROM AN OLD MANSE. In Two Parts. New York:: Wiley and Putnam,, 1846. First edition, one-volume clothbound issue [Clark A15. 1.c1--"third printing, Wiley and Putnam issue"; BAL 7598--"when issuing the book in cloth (as a single volume) the publishers used whatever sheets they had in stock, and copies in cloth, therefore, frequently are of intermediate status]. . Spine and corners worn and frayed, with few short tears and small chips on spine, text lightly foxed, few signatures sprung, but hinges and binding tight, text fresh and quite clean. A good to very good copy of an uncommon title. . Green cloth, pp. vi, 207; vi, 211 [with page 212 in volume two blank-- BAL states, "In the earliest printings p. 212, Vol. 2, is wholly blank"]. In Clark's survey of the type batter in both volumes, this copy conforms to his third printing. Clark also states "final leaf of vol. II removed before binding in many copies examined"-- this copy retains the final leaf. New York: Wiley and Putnam, 1846. Hardcover. Very Good. Two parts in one volume: , 207, , 211,  p.; 19 cm. Modern rebacking of contemporary leather spine and corners with original marbled paper over boards. Original brown endpapers. Series title preceding title page for Wiley and Putnam's Library of American Books. First edition, first issue with R. Craighead's Power Press and T.B. Smith, Stereotyper, on the verso of the title page, verso of part 2, p. 211 blank. BAL, 7598. Wright (I), 1143. The 19th-century binder removed the Part Two title page and publisher's advertisements, and bound the table of contents for Part Two after the table of contents for Part One. Undated catalog description attached to front fixed endpaper. Former owner's name on front free endpaper: "Wm. Ellery Sedgwick" [William Ellery Sedgwick]. Inscription in another hand on blank leaf following front free endpaper dated 1916. In Very Good Condition: modern rebacking and repair of endpaper hinges; light foxing in margins; a few pages soiled; otherwise clean and tight. New York: Wiley and Putnam, 1846. 1st Edition. Cloth. Good+. 12mo - over 6¾ - 7¾" tall. 1st edition. 2 volumes in one. 12mo., 207; 211; 4 pages of ads at the end. 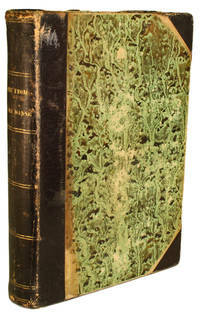 Bound in the publisher's green cloth; decorated in blind, with the title in gilt on the spine. Mildly soiled, with a few small tears along the spine's joints. Internally clean. Good. *** The copyright page lists R. Craighead's Power Press and T.B. Smith, Stereotyper. Both volumes have their own title page, and page 212 is the Publisher's "New and Valuable Books" ** A 1960's era tourist item from the Colonial Inn in Concord, laid in, with plastic pouch containing "Moss from the Old Manse", with a bit of moss in the pouch. *** Many of the tales collected in Mosses from an Old Manse are allegories and, typical of Hawthorne, focus on the negative side of human nature. Boston: Ticknor and Fields. Very Good- with no dust jacket. 1854. Hardcover. No signatures. Some rubbing and abrasions to leather. Joints intact. Some splitting to endpapers along gutters at hinges.. 1/8" rubbed away from leather at head of spine on first volume. Minor dampstain and tidemarks to upper outer corners of last few leaves of first volume. ; Second American edition. Two volumes (complete). Rebound in full brown calf. Each volume with five raised bands on spine, two red-brown lettering pieces with gilt lettering, blind tooled triple border to boards. All page edges dyed red. Marbled endpapers. Binding date uncertain, later 19th century? Page dimensions: 177 x 109mm (7" x 4 3/8"). This second American edition was revised by Hawthorne, and has three additional selections published in collected form for the first time - "Feathertop; a Moralized Legend" in the first volume, and "Passage from a Relinquished Work" and "Sketches from Memory" in the second volume. Without final blank leaves as called for in Clark, but with a single blank fly leaf (not integral with the gatherings) present at the front and rear inside of the free endpapers in each volume. [Bibliographical reference: Clark A15.3.a.] . 20040726. Good. Ships with Tracking Number! INTERNATIONAL WORLDWIDE Shipping available. May not contain Access Codes or Supplements. May be ex-library. Shipping & Handling by region. Buy with confidence, excellent customer service! Boston: Ticknor and Fields. Good with no dust jacket. 1854. 2nd Edition. Hardcover. First printing of the second (New) edition; Blind stamped cloth covers, with gilt stamped lettering on spine; Covers show a little chipping at spine ends and light rubbing along edges, though remains clean and with fairly bright lettering; Institutional stamps on blank front end leaves of both volumes, and inked name on verso of blank front free end page of volume I; One signature near center of volume I is slightly loosened; A little foxing on first and last few leaves of each volume, though a little heavier in Volume II; There are a couple of penciled notes in margins, though both volume remains generally clean, tight, and otherwise intact. .
20100908. Good. Ships with Tracking Number! INTERNATIONAL WORLDWIDE Shipping available. May not contain Access Codes or Supplements. May be ex-library. Shipping & Handling by region. Buy with confidence, excellent customer service! 2016-08-27. Good. Ships with Tracking Number! INTERNATIONAL WORLDWIDE Shipping available. May not contain Access Codes or Supplements. May be ex-library. Shipping & Handling by region. Buy with confidence, excellent customer service! 20110907. Good. Ships with Tracking Number! INTERNATIONAL WORLDWIDE Shipping available. May not contain Access Codes or Supplements. May be ex-library. Shipping & Handling by region. Buy with confidence, excellent customer service! 20110903. Good. Ships with Tracking Number! INTERNATIONAL WORLDWIDE Shipping available. May not contain Access Codes or Supplements. May be ex-library. Shipping & Handling by region. Buy with confidence, excellent customer service! Boston: Ticknor & Fields, 1854. This the "New Edition, Carefully Reviewed by the Author" (with three new stories). Very good overall condition with light to moderate wear. No tears stains, or foxing. Previous owner name neatly written on flyleafs.. First Thus. Hard Cover. Very Good. 2016-03-29. Good. Ships with Tracking Number! INTERNATIONAL WORLDWIDE Shipping available. May not contain Access Codes or Supplements. May be ex-library. Shipping & Handling by region. Buy with confidence, excellent customer service! 2012-08-30. New. Ships with Tracking Number! INTERNATIONAL WORLDWIDE Shipping available. Buy with confidence, excellent customer service! 2012-07-29. Good. Ships with Tracking Number! INTERNATIONAL WORLDWIDE Shipping available. May not contain Access Codes or Supplements. May be ex-library. Shipping & Handling by region. Buy with confidence, excellent customer service! 2012-08-14. New. Ships with Tracking Number! INTERNATIONAL WORLDWIDE Shipping available. Buy with confidence, excellent customer service! 2005-10-25. New. Ships with Tracking Number! INTERNATIONAL WORLDWIDE Shipping available. Buy with confidence, excellent customer service! 2012-08-14. Good. Ships with Tracking Number! INTERNATIONAL WORLDWIDE Shipping available. May not contain Access Codes or Supplements. May be ex-library. Shipping & Handling by region. Buy with confidence, excellent customer service! 2005-10-25. Good. Ships with Tracking Number! INTERNATIONAL WORLDWIDE Shipping available. May not contain Access Codes or Supplements. May be ex-library. Shipping & Handling by region. Buy with confidence, excellent customer service! The Large Print Book Company, 2009-03-02. Paperback. Good. 2019. SUPER DELUXE EDITION. New. Antique look with Golden Leaf Printing and embossing with round Spine completely handmade binding(extra customization on request like Color Leather, Colored book, special gold leaf printing etc.) Reprinted in 2019 with the help of original edition published long back . This book is printed in black & white, sewing binding for longer life, Printed on high quality Paper, re-sized as per Current standards, professionally processed without changing its contents. As these are old books, we processed each page manually and make them readable but in some cases some pages which are blur or missing or black spots. We expect that you will understand our compulsion in these books. We found this book important for the readers who want to know more about our old treasure in old look so we brought it back to the shelves. Hope you will like it and give your comments and suggestions. Lang: - eng, Vol: - Volume v.2., Pages 310. EXTRA 10 DAYS APART FROM THE NORMAL SHIPPING PERIOD WILL BE REQUIRED. (Normal Hardbound Edition is also available on request.) Volume v.2. Kessinger Publishing, LLC, 2011-02-01. Elibron Classics series. Hardcover. Good. 2019. SUPER DELUXE EDITION. New. Antique look with Golden Leaf Printing and embossing with round Spine completely handmade binding(extra customization on request like Color Leather, Colored book, special gold leaf printing etc.) Reprinted in 2019 with the help of original edition published long back . This book is printed in black & white, sewing binding for longer life, Printed on high quality Paper, re-sized as per Current standards, professionally processed without changing its contents. As these are old books, we processed each page manually and make them readable but in some cases some pages which are blur or missing or black spots. We expect that you will understand our compulsion in these books. We found this book important for the readers who want to know more about our old treasure in old look so we brought it back to the shelves. Hope you will like it and give your comments and suggestions. Lang: - eng, Vol: - Volume v.1., Pages 300. EXTRA 10 DAYS APART FROM THE NORMAL SHIPPING PERIOD WILL BE REQUIRED. (Normal Hardbound Edition is also available on request.) Volume v.1. [Columbus] Ohio State University Press, 1974.. Hard Cover. x, 664 p., 25 cm. Centenary Edition of the Works of Nathaniel Hawthorne: vol. 10. Fredson Bowers, textual editor. A collection of some of the great short stories in American Literature. First published in 1846. This is now the authoritative text. In print at $80. Vg/no dj. Stock #101,295. American Literature.